"This is a humble path"
This is a humble path, the words rang out in our Rocket yoga training circle on the last day. After 5 days of intense asana practice and self-discovery, we all came together to sit in our Rocket circle and talk about, "what is our Rocket?" and what we discovered is the stronger you get on the mat the more humble you become. Humble to be able to practice the asanas, and humble to be able to share your love of the Rocket. Most people don't know that the other day as I was leading Rocket one, when I spoke the words reverent to my class as they focused their dristi, a flood of love and gratitude swept over me as I remembered my friend and teacher Larry Schultz and everyone that I have met along the way. It just goes on and on, love and being reverent for being in the presence of beautiful people. For me today, that is my Rocket, being humble as the world opens up its beautiful arms and nurtures me with such an amazing practice. Remember the practice will always give you what you need when you need it, have faith and stay true to your beliefs. In our system, the students become the teachers and the teachers become the students. 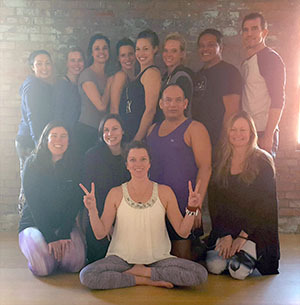 So I am happy to report our 5 day Rocket yoga training we ALL learned something and we all became stronger, by working together and keeping our dristi focused. The Rocket will give you the tools to be stronger on and off the mat. The Rocket will teach you how to focus. The Rocket helps us find ourselves and awaken our voice of the inner teacher on and off the mat. Like Larry said, "it keeps us in gear, moving towards our goals". So thank you all for coming together for our 5 day training. I was so happy to hear how many of you loved Cincinnati and found it fun and AFFORDABLE!! That is awesome, I am reverent for being able to share the practice with you and for you all making me a better person. We all had a good laugh when we talked about how when you come to Rocket training you are really learning how to sweep the floors and light incense! Yoga ah comes from the rock and roll world of yoga. In the late 80's Sting was traveling with an Ashtanga yoga instructor when the Grateful Dead caught wind of this they decided they too wanted to travel around with an Ashtanga yoga instructor. That was when they discovered Larry Schultz. Larry Schultz traveled with the Grateful Dead for 3 years as their private yoga instructor. Larry was a pioneer in introducing the ancient art of Ashtanga yoga to the masses. While he was on the road with the Grateful Dead he resequenced the poses around the joints of the body, inviting in more core strengthing ways to practice, this became known as the Rocket. In addition, to creating the Rocket Larry also began instructing a routine called The Modified Primary Series or MPS. The MPS is a way that new yoga students can learn the foundation of what Ashtanga yoga is without committing to a full Primary series. We have adopted the rock and roll world of yoga at our studio. We often use terms like "go with the flow" and "relax and breathe" and at the same time all Yoga ah instructors are thoroughly trained and have experience in safe alignment practices. Even Madonna and Gwenyth Paltrow have practiced Ashtanga. In the beginning it may feel challenging and scary to do something new, however, our yoga community is so supportive of each other that you may find yourself laughing as you fall out of a crow pose. We know that the world is serious enough, we often say that Yoga ah is a play ground for adults. To keep things light and fun at the studio most of our classes have music playing, you may hear reggae or more recently David Bowie and of course Grateful Dead. Larry studied with Pattabi Jois so we are also part of a great lineage of teachers, you will see pictures of the great gurus around the studio. All the classes are comfortably warm and we promote sweating as a way to detox your body and mind. If you are curious at all, come check us out! As we are ending one year and looking towards a new one, many of us are taking time to reflect on the past as well as set goals for our future. Reflecting back over at the past year so much has been happening at the AH! WE moved into our new location and began offering more classes than we ever have in the 8 years we have been open. We offered 3 Rocket yoga trainings and over the course of the year we had 3 different teacher training groups. We began posting more video on our Yoga ah You Tube channel and began to embrace the new age even more with beginning an Instagram account and every Wednesday at 5:00 eastern time we are broadcasting live Rocket 2 on Periscope. We have had a big year and a lot of growth. As we reflect we want to thank all of our amazing yogis that come back to the mat year after year and all the new ones that keep walking thru the door. There are so many politics about signage on our building that we still don't have our official signage and map quest sometimes directs students to our old location but somehow everyone finds Yoga ah. Of course, I think that not having a sign and how yogis just know where to show up is really cool and auspicious even tho this coming year we are hoping to have our sign up! In today's life, technology is moving faster and faster and we have an opportunity to expand the way we communicate we must keep in mind that nothing can replace human interaction, and clear direct communication with the people we surround ourselves with on a day to day basis. Yoga instructors at Yoga ah have to develop a positive script to communicate the instructions of the poses to the students. The heart of communication begins by being present with the people in our life, so even tho it may be easier to send a text, in the new year let's pick up the phone to hear the genuineness in someone's voice. One of our yoga friends in San Francisco reminded us that "there is more Ashtanga happening in Cincinnati then in San Francisco," and they are right. We are blessed, so lets practice together and have an attitude of gratitude in everything we do. Lets be present with our loved ones, lets express our wants and needs to each other and most importantly lets be grateful for our yoga community and this beautiful practice that keeps bringing us together. Practice, practice, practice ALL IS HERE!! Rocket Yoga Training can begin after you have completed a 200 hour yoga training and would like to learn more advanced yoga sequencing and transitions. Rocket yoga training is based in Larry Schultz's Rocket Yoga. 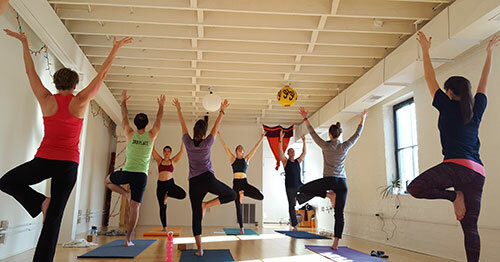 "Our training school has met the stringent requirements set by Yoga Alliance Professionals, demonstrating that our courses are of the highest standard and that our graduates may register with Yoga Alliance Professionals to use their relevant membership level designation, as a sign of quality training. Module 1 and 2 Rocket Booster - 60 Hours - 5 days - 40 contact hours - 20 non contact hours - Focuses on Rocket 2, if you have been instructing Rocket you will have an oppurtunity to instruct and refine your Rocket 2 script. Then Pattabi looked at Larry and he said “you bad man, all is coming 25 years.” Larry’s eyes got big and he thought to himself, I’m 30 years old now, when I’m 55, I’ll know what he’s talking about,” and what Larry found out was late in life you could have love, health, and happiness late in life no matter what. He also realized how long this practice is!! It’s a very long practice and if you’re good, medium, or bad student, all is coming, just keep practicing. What can we learn from this story? Larry left his physical body over 4 years ago and during that time many of his students have been searching and wondering, where is their practice going? what did Larry teach us? and ultimately the big question is what were Larry's deepest wishes for the Rocket and his beloved students? The story reminds us that this is a long practice and sorting all this out takes time, time for our Rocket yoga community to heal and get organized. When Larry was alive we all sat in the same circle and as David Kyle of Ashtanga Yoga Puerto Rico reminded Amber Gean , "why can't we all sit in the same circle again?" Larry wanted us to be working together to keep the dream alive, so after four years Larry left his physical body Amber Gean and David Kyle sat in the same circle last week and are hoping that this is just the beginning, allowing the circle to grow. New yogis are coming in that have never met Larry and for those that studied with Larry feel it is more important than ever to have someone in the circle that studied with Larry to share the good word of the Rocket. This is a mountain and we must climb, Larry taught us well and he left his closest students with the teachings inside of them and he gifted them to share the Rocket freely, at It's Yoga San Francisco Larry would have free hand outs of Rocket sequences available for anyone coming through the door. Larry's closest students have been working around the clock to refine materials to make Rocket yoga training's, available to the masses. They do this with great reverence to their teacher Larry. 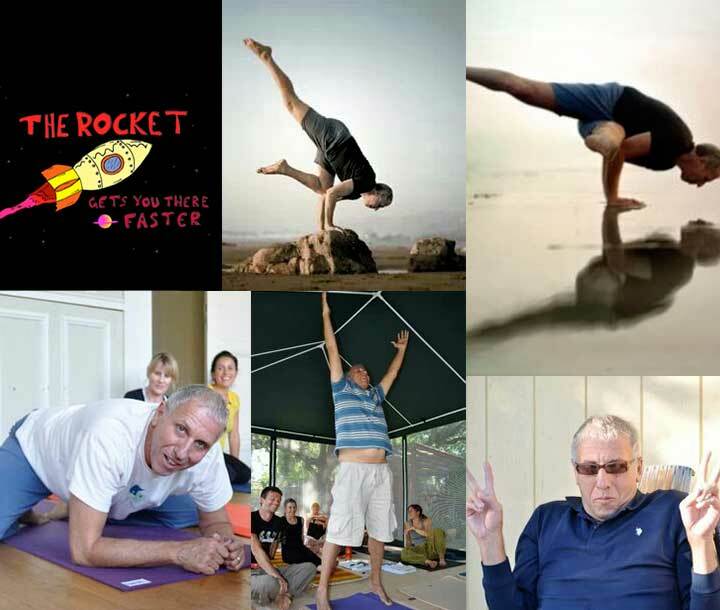 They believe " do you practice and all is coming" even if it takes 25 more years to organize a Rocket yoga alliance to give creditability to all of the yogis who have given their life to the Rocket yoga practice and for Larry so his legacy may live on for many many many more years.